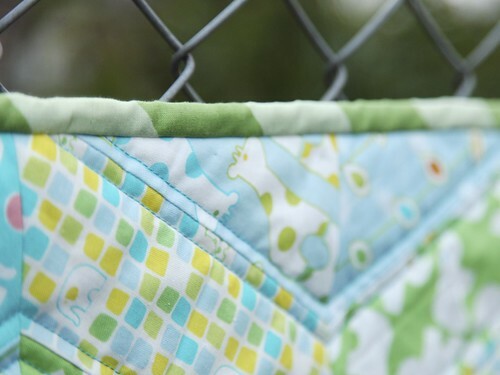 A few weeks ago Tobit asked me if I had any baby quilts in stock that he could gift to a colleague who was soon to go on maternity leave. Unfortunately for me the gender of the baby is unknown so the floral vintage sheet baby quilts that I have therefore may not be suitable. 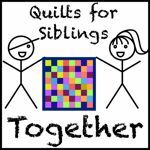 So last week I asked Tobit if he would like me to make a quilt, funnily enough he didn’t say no! I fancied making a plus quilt and pulled out my Summersville stash and then realised I might have to apply a fair amount of brain power to make it happen. 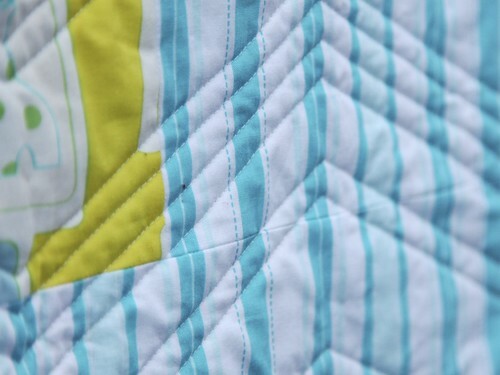 I had a quick search on pinterest for baby quilt with fat quarters and discovered a herringbone quilt tutorial (link no longer valid – sorry) using just 6 fat quarters. It’s Savanna Bop by Thomas Knauer which I won for I project I submitted to Your Andover Projects. 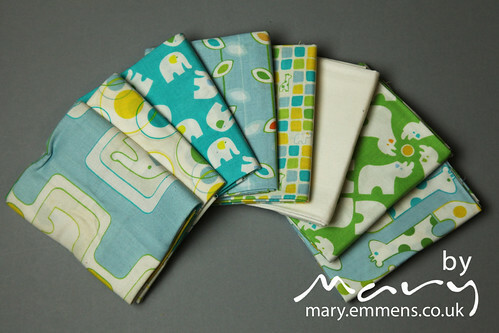 I used the white ages ago but knew this bundle would be fine for a unisex baby quilt. A quick whizz with the iron, a fair bit of cutting, a pile of stitching and by the end of the evening I had 3 columns pieced. More stitching time sneaked in the next day and before long I had a quilt top. Unusually for me I picked out the backing and binding fabric at the same time as the quilt top. I wanted to make sure that I could get it finished using stash and not having to wait around for fabric to arrive. After the problems I had with the Christmas Swoon this was an absolute delight to quilt. For quilting I used Aurifil 2810 28wt in the top and a white in the bobbin; I’ve not quilted using anything heavier than 40wt before but this was a perfect colour match so it had to be done. So it’s off to it’s new home today and I’m hoping it will keep the baby boy/girl snug and warm through the winter months. Go you! This actually looks vintage to me as the colours are quite similar and I love the way you have quilted it as well. Lucky baby! 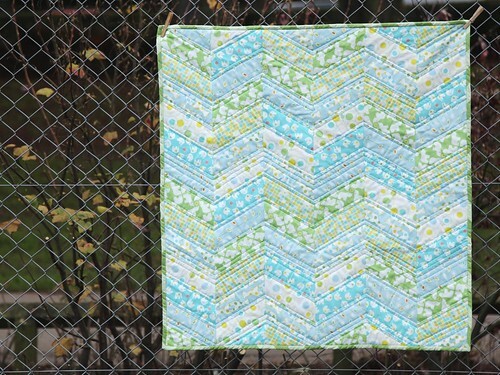 That is such a pretty quilt! 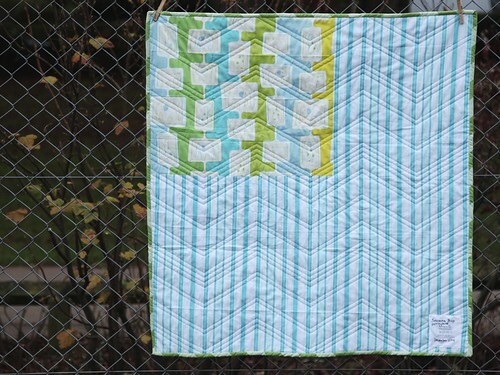 I love the way the quilting adds to the motion of the zig zag effect. Great job, I do love a quick project when put under pressure! That’s gorgeous – I am sure the recipient will love it! OMG!! 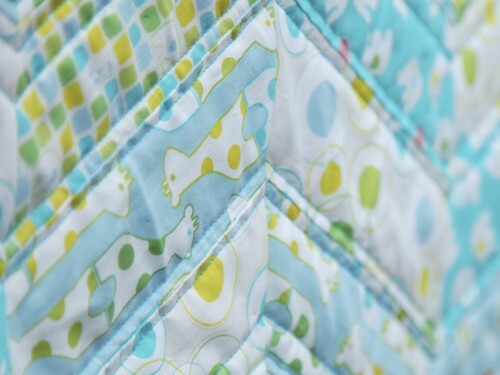 I love your baby quilt – the colours and prints are gorgeous! I have 3 friends expecting and this is such a great pattern! Thanks for sharing! !